Nationally, 48 percent of college students reported food insecurity, or not having access to affordable and sustainable food, within the previous month according to a study conducted by the College and University Food Bank Alliance. Many colleges in Utah offering a food bank to help solve this problem. University of Utah’s Feed U Food Pantry is open to all University of Utah students, faculty and staff. It has been open for four years. Utah Valley University’s You Can Pantry offers students non-perishables, grocery bags, basic hygiene kits and child care supplies as long as they are taking six credits during the spring or fall semester. Utah State University’s Student Nutrition Access Center is offered to those with a student ID. Eight years ago, a group of students addressed student hunger and came up with the idea to offer students non-perishable foods, fresh vegetables, bread, yogurt and pastries. It is open to students three days a week for two hours each day. Weber State University’s Weber Cares program provides students with two options: a food pantry where students can grab food they need or a $10, same day use, food voucher for on campus dining options. 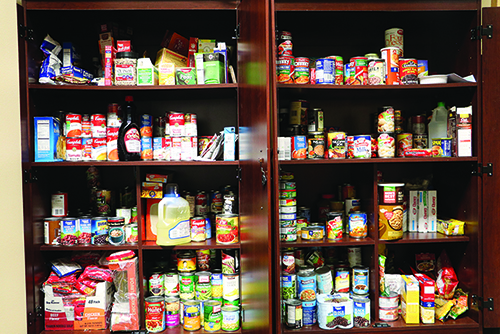 Dixie State’s food pantry provides non-perishables, hygiene and feminine products. USU Eastern’s food pantry incorporates many of the things that the other Utah universities offer. The Eagle Food Pantry is sponsored by the SUN Center and regularly receives donations of non-perishable foods. This food is available for the use of any USUE student who needs it. There are no requirements and minimal paperwork. The Eagle Food Pantry provides non-perishables and meal swipe vouchers for on campus dining. To access the food, students may go to the housing office, take what they need, then report what they have taken to Administrative Asst. Sharon Jones for inventory purposes no questions asked. Another resource locally for students in need of sustainable nutrition is the Blessings Box located in front of the Trinity Christian Center next to Smith’s shoping center on Main St. This box is there for those who need it. Anyone can donate what they can or take what they need.